For many, graduation day is around the corner. While graduating from college or high school can be an intimidating time, there’s hope for recent graduates in the job search. According to a survey by Michigan State University, 97% of employers plan to hire at least one new college graduate this year. While the odds are in your favor, you have to put in the effort to land the job of your dreams. To help you join the workforce, check out these five tips for making your move after graduation. A recent Movin’ On Up article compiled survey results from a variety of institutions who conducted research on the 2015 job outlook for recent college graduates. These results included a look at the job forecast, which revealed that employers plan to hire 9.6% more graduates in the United States than they did in 2014, and lists of the most in-demand college degrees and skills for new hires. Before you start your post-graduation job search, check out the statistics to better understand what employers want. Whether you’re graduating from high school or college, it’s never too early to create a LinkedIn profile. Even if you don’t have much to add to your profile yet, go ahead and get started on your account so you can use it to network with potential employers and get noticed. Forbes states that only one-third of college students have a LinkedIn profile, so creating one of your own is a quick and easy way to stand out from the competition. Include any jobs you’ve had, from babysitting to retail, and list the skills you gained from those jobs. Make sure you also list your educational achievements, including any degrees, diplomas, and extra-curricular activities like newspaper or debate club. If you received any awards in school or your community, like volunteer or academic honors, list those too. It’s important to remember that while employers are primarily searching LinkedIn for potential candidates, they can also find your other social media accounts too. So, keep your Facebook, Twitter, and other public profiles clean and professional at all times. Get an internship, or volunteer in your community. According to a study by Millennial Branding, a research firm, 85% of college students believe having an internship is either important or very important for their career. Furthermore, 52% said they hope to have had three or more internships before graduating, and 40% have already completed one internship. Since so many college graduates are looking to internships to gain experience, skills, and networking opportunities, you want to make sure you’re one of them. Try to find companies that are easily recognizable, either in the community or nationally, to help your resume stand out. In addition to internships, you can also get ahead of the competition by actively volunteering in your community. There are numerous volunteer opportunities to consider, from working at a food pantry to helping build houses for the needy. By volunteering, you not only add valuable skills to your resume, but you also have the opportunity to network with others and do something charitable in the process. We’ve talked about the importance of having a mentor, and the results of Millennial Branding’s survey support our stance. In fact, the survey revealed that 70% of college students have at least one mentor. Among the mentors listed were parents, professors, family, friends, and employers. Having a mentor can help you grow both professionally and personally, and can even help you on your job search. But, finding the right mentor is important to making sure you’re learning all you can. When you’re ready to pick a mentor, check out these five traits of a great mentor first. Call on your school for help. If you’re a college student, your school’s career services office can help you with the next step in your job search. Career offices can assist with resumes, cover letters, job interviewers, and more, but Millennial Branding reveals that only 29% of students use these offices. Be part of that group by visiting your school’s office and asking about what resources they can offer. 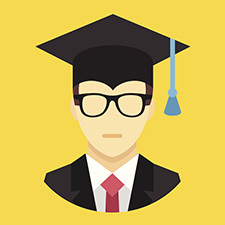 In addition to workforce preparation, many offices also have an alumni database, which can help put you in contact with recent graduates in your field of study. Those graduates have already been in the workforce for a few years and may have tips of the trade you could learn, so take advantage of those resources. Congratulations to the class of 2015, and good luck with your job search! Remember, even if you’re not a recent graduate, these tips can help you with your job search goals. It’s never too early to get started! How do you plan to make your move after graduation? Let us know in the comments section below!